When you need to recharge, Austin delivers the jolt you need at some quirky coffeehouses serving up some darn-good java. Here are the top 5 places in Austin to grab a cup of brew this fall. Buzz Mill: Take a break from the daily grind at this log cabin-inspired coffee shop, which is also a full service bar. Located on East Riverside, Buzz Mill brews up locally roasted coffee and homemade infused liquors. Grab a seat inside the lumber-lined walls of the fort, or head outside to the "backyard," where you can enjoy food with your coffee from two food trucks: Blue Ox and The Vegan Nom. The Buzz Mill hosts live music and offers games for even more entertainment. 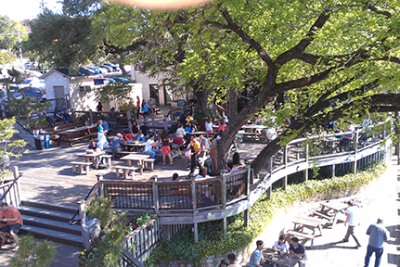 Mozart&apos;s Coffee Roasters: Sip a latte as you take in the view of Lake Austin at this local favorite. Mozart&apos;s offers fine gourmet coffees from around the world, flame roasted on site every 48 hours for unbeatably rich flavor. The outdoor patio is the place to be on pleasant fall afternoons, and live music plays Thursday through Sunday. If you&apos;re craving something sweet, Mozart&apos;s bakery sells delicious desserts like fruit tarts, canoli and mocha cake. Yum. Genuine Joe&apos;s: Feel right at home at this neighborhood coffeehouse, known for its friendly staff and fresh roasts. Select traditional coffee drinks or opt for a house special (the Honeynut and 3 Way Mocha are must-trys). Grab a seat in one of the plush couches or chairs for a relaxing afternoon. You can enjoy open mic nights and live music on Thursdays and Saturdays. Spider House Patio Bar and Cafe: Considered one of the best coffeehouses in the city, Spiderhouse is a legendary UT campus staple. The laid-back café features gourmet coffee, as well as a menu of craft beers, wines, sandwiches and baked goods. Find a personal nook inside to enjoy your brew or mosey out to the patio, where you can admire one-of-a-kind antiques, art installations, twinkling lights and even swings. There&apos;s also no shortage of live music and movie screenings to enjoy nearly every night of the week. Frank: The name screams sausage, but this hot dog heaven also brews up an impressive cup of coffee. While you wouldn&apos;t expect to find your caffeine fix here, Frank surprises with an all-star selection of roasts that are hand-crafted and made-to-order, guaranteeing you the freshest cup of coffee in town. Order a café miele or cortado (dine-in only) and pair it with another Frank favorite: chocolate-covered bacon.